Carpet End Hardwood Dollies. 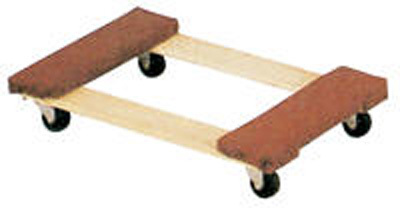 Transport boxes, crates or supplies with these rugged dollies. Units maneuver on four swivel hard rubber casters. Assembly required. Optional Pull Strap or Hook available. Specs: capacity 900 lbs. Available in 16" x 24 " x 5.75" and 18" x 30" x 5.75".